So she slept through the night on Sunday, and without any accidents, you can’t imagine as a dog mama, how happy I am. I know part of this is the idea that we were home all day and she had the run-run-run of the house with Ralph. All the toys were strewn to heaven and back a few times over, and then again for good measure. She got her first bath outside and I quote “still stinks”, oh the life of a puppy and getting into everything. She did however start to snuggle this weekend and really get into being in the “group”, loved on, watching tv and plainly “hanging out”. The cowbell is our latest addition to the craziness in the house. Penny’s accidents are really mostly happening because she can’t get my attention to go outside. Enter “more cowbell”. I’ve put one on a ribbon by the back door. On the first inkling that she may want to go outside, I headed to the back door and rang the bell, and opened the door. About an hour later, in the middle of watching a movie, I heard a slight clang from the back door! WHOA! 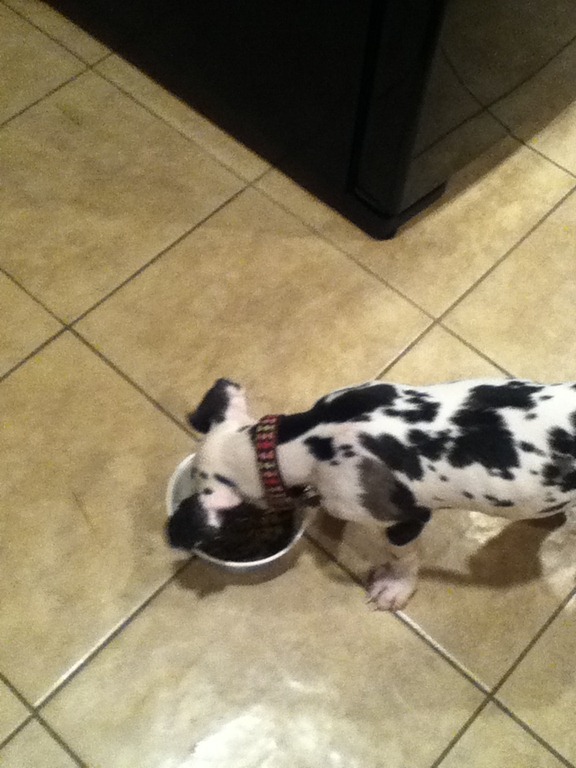 I jumped up, opened the door, and there went my puppy – SHE GOT IT! SHE GOT IT! There was a victory dance. A few of them. and no accidents. Amen for some light bulb going off. That said, never having a big dog before, I’ve now learned that toilet lids better be kept down at all times. I did arrive to a bathroom to find what looked like a canine drunk sorority girl over the tank. Sigh. Lesson learned. She is growing out of her bed time crate, I’m a left wondering what to do next. I have a taller crate in the garage that I will probably unearth and use next, but then at what point should I just let her sleep in there? Teething and accidents are still happening, I know now is not the time. She’s so smart, so sweet, so perfectly droopy eyes that you just want to hug her. She’s going to be getting me on my running plan soon, she loves to bound and play and GO! However, when she’s done…she.is.done. Flop, bam, crack, wherever. I sometimes have her plop down on the bathroom tile when I’m getting my makeup on and she sighs after a good run around with Ralph and I just think “OUCH! That collapsing bump noise on the floor has got to hurt.” but she’s content to be at my feet, being hugged, or just somewhere being noticed – and she’s noticed – for all the wonderful things she is. 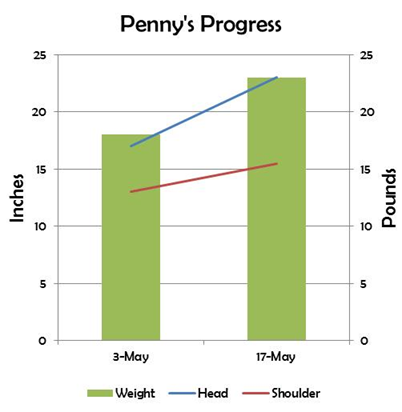 To track her weight and height, I thought I’d include this nifty thrifty little graphic every other week so we can watch together. She definitely looks like she’s grown, I just saw her shoot up and boy, I was right!